Mayor Martin J. Walsh’s administration sued the state gambling commission Monday to try to derail a Wynn Resorts casino project in Everett, asking a court to void the commission’s endorsement of the Wynn project and to declare that Boston has the right to hold a binding vote on the development. Throughout his first year in office, the mayor has repeatedly blasted the five-member commission — sometimes in highly personal tones — and the 75-page lawsuit in Suffolk Superior Court is packed with heated rhetoric against the panel. Walsh accuses the commission of deliberate law breaking, and of ignoring provisions of the state’s 2011 casino statute. He alleges the commission waved off Boston’s concerns about its rights under the casino law last year by holding a “mock hearing” with a predetermined bias against the city. “The commission has ignored the facts, conducted an improper proceeding, and rendered a decision that is legally and factually defective,” the suit states. The cities of Revere and Somerville have already sued the commission to block the Wynn development, using some of the same arguments Walsh cites in his litigation. 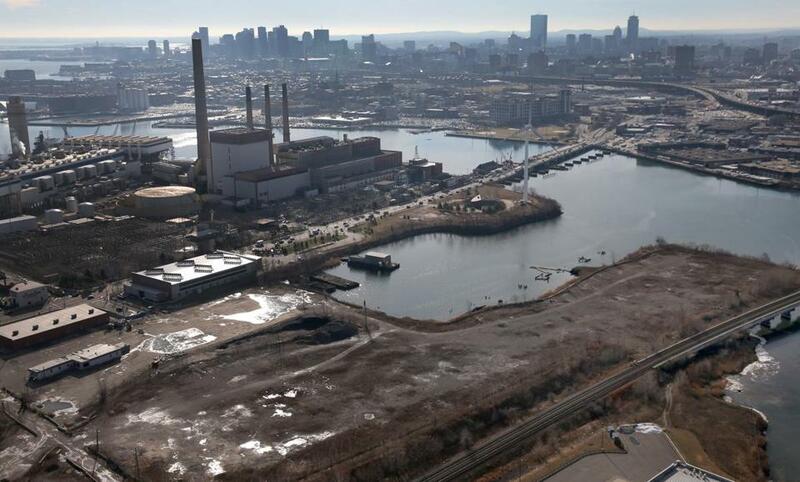 Wynn Resorts has finalized its acquisition of 33 acres of waterfront land on the Mystic River, Wynn announced this morning. Walsh’s lawsuit contends that the commission should have disqualified Wynn because of alleged criminal activity by the former landowners of the Everett property where Wynn intends to build. The suit also says that access to the Wynn site is through Boston, which should give Boston the right to hold a vote on the project as a “host community” under the state casino law. “With Boston providing the sole access point to the casino site, the vast majority of patrons would be required to drive through Rutherford Avenue and Sullivan Square in Charlestown — an area that already faces severe traffic congestion,” Walsh said, in remarks about his lawsuit. “The commission believes that we have reviewed these issues thoroughly, objectively, and fairly, and that exhaustive review helped lead to the decision to award the Wynn license with appropriate conditions,” Driscoll said in a prepared statement. 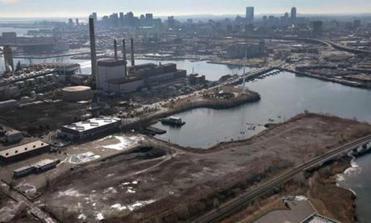 Wynn won the Greater Boston casino license in September, beating a competing Mohegan Sun proposal for Revere. The commission explained at the time that it selected Wynn, in part, because the Everett project had a more secure financing plan, called for greater capital investment in the physical building, and would create more jobs. Had Mohegan Sun won the license, Boston would have gained a windfall of $18 million a year from the developer, under a compensation agreement Walsh negotiated with the casino company. He was unable to reach a similar deal with Wynn, and the compensation package the commission imposed on Wynn is not as lucrative. Neither Wynn Resorts nor Everett Mayor Carlo DeMaria would comment Monday on the lawsuit. Lifelong Everett resident Vincent Ragucci, a supporter of the Wynn project who campaigned for its approval, said Walsh was being a “poor sport” and that “people are getting tired of it. We’ve done everything by the book,” he said. Much of Walsh’s lawsuit recounts the complicated history of Wynn’s deal to buy the 33-acre Everett property on which the company intends to build. The land deal has been a source of criticism and controversy since 2013, when state investigators found that a Revere felon, Charles Lightbody, may have had an undisclosed ownership stake in the property. Wynn, in response, slashed the purchase price for the land from $75 million to a market rate price of $35 million, based on an appraisal of the property, to deny any undisclosed stakeholders a premium for selling to a wealthy casino company. The gambling commission approved the plan at the time, after its investigators found no evidence Wynn Resorts was part of the alleged deception. Lightbody and two other men linked to the land were indicted last October on charges of lying to state investigators in an attempt to hide Lightbody’s interest in the property. The city’s lawsuit insists Wynn should have been disqualified from the casino competition, due to requirements in the law that applicants show that the people with a financial interest in the casino are suitable to hold a gambling license. The Gaming Act prohibits a casino license application from advancing if a convicted felon has a financial interest in the premises on which the casino will be located,” the suit contends. The gambling commission sees the law differently, and has concluded that parties in a real estate transaction “are not gaming vendors or nongaming vendors and thus are not subject to the vendor licensing requirement” that would apply to felons, according to a 2014 analysis by the commission’s general counsel. Commission lawyers will review the suit and the state will craft a response. It will be up to a court to decide if the litigation goes forward. Wynn Resorts said Monday — hours before the lawsuit became public — that it had finalized the land sale and taken ownership of the property. A company official has said Wynn wants to begin environmental cleanup of the polluted site when the ground thaws in the spring. Vennochi: What did Everett really win?